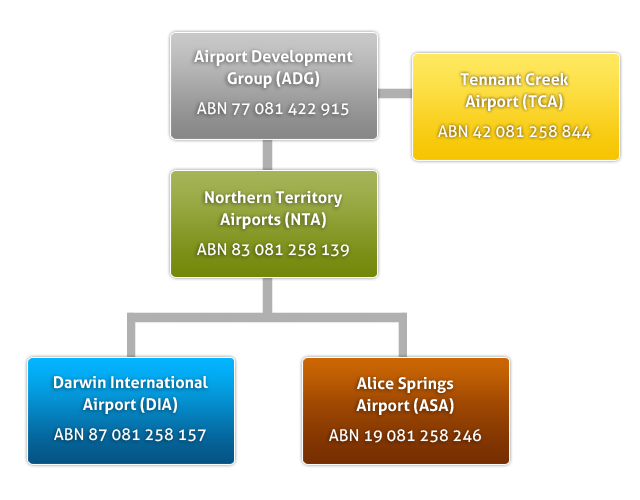 Airport Development Group (ADG) acquired a lease for the three Northern Territory Airports (comprising Darwin International Airport, Alice Springs Airport and Tennant Creek Airport) from the Commonwealth Government with a commencement date of 10 June 1998. ADG is the ultimate parent company of the group (view company structure diagram). ADG owns 100% of Northern Territory Airports Pty Ltd (NTAPL) which, in turn, owns 100% of Darwin International Airport Pty Ltd (DIA) and Alice Springs Airport Pty Ltd (ASA) who are respectively the holders of a 50 year lease over Darwin International Airport and Alice Springs Airport with free options to renew for a further 49 years. ADG also owns 100% of Tennant Creek Airport Pty Ltd (TCA) who are the holders of a 50 year lease over Tennant Creek Airport with free option for a further 49 years. ADG is majority Australian owned, a requirement of the Airports Act 1996. View current ADG ownership structure. In our direct airport companies, we employ over 80 full-time employees and contract many other personnel to provide key airport services. Together with our airline customers, we handled over 2.4 million arriving, departing and transit passengers, and the combination of all of the on airport and off-airport businesses that support them contribute over 1.5% of the Gross State Product of the Northern Territory. Moreover, we employ over 1600 people when including our airline customers. Chris Barlow has more than 40 years’ experience in the aviation industry. From July 2000 until August 2007 he was Managing Director and Chief Executive Officer of Australia Pacific Airports Corporation, the operator of Melbourne and Launceston Airports. Prior to this, he had several roles with BAA PLC (formerly British Airports Authority), the United Kingdom airports company. These included being Managing Director of Aberdeen Airport and Corporate Development Director. He has worked in the United Kingdom and North America. Chris is also the Chair of the Melbourne Visitor and Convention Bureau, a Director of ARTC and Visit Victoria. Chris has a Bachelor of Science (Honours) in Civil Engineering and is a member of the Institute of Civil Engineers. He is married with five children and his interests include the theatre, arts, tennis, rowing and golf. Barry Coulter has worked in the Northern Territory for more than 35 years. He was elected to the Northern Territory Legislative Assembly in 1983 and went on to hold positions such as Treasurer and Minister for Mines and Energy, and served as Deputy Chief Minister from 1986 to 1995. Barry spearheaded the Alice Springs to Darwin Railway Project for almost 14 years, and stepped down from politics in 1999 following the announcement that the project would move ahead. Barry also has signficant experience in the sea ports, and aviation sectors, and was previously Executive Director of Sherwin Iron Ore Limited, Chairman of Darwin Port Authority and Chairman of Airnorth. Barry is a Fellow of the Australian Institute for Management. Barry is currently on the board of the Northern Australia Infrastructure Facility (NAIF). In 2019 he was awarded the honour of Officer in the General Division (AO) in the Australia Day Honours for outstanding service to politics and business in the Northern Territory. Michael is responsible for the origination, analysis, structure and execution of fund investments, along with ongoing management of assets within the existing infrastructure portfolio. Prior to joining IFM Investors, Michael was involved with industrial reserach and development, oil and gas exploration, field development, engineering and planning, and strategy development and execution at BHP Billiton. He led a number of oil and gas asset transaction on behalf of BHP Billiton as Manager, Acquisitions and divestments. He represents IFM Investors as a Director on the boards of Airport Motorway Ltd and Interlink Roads. Marigold is an Investment Director with IFM Investors. She has 15 years experience in infrastructure, investment evaluation, asset management and corporate finance. At IFM Investors, Marigold is responsible for the origination, analysis, structure and execution of fund investments, along with ongoing management of assets within the existing infrastructure portfolio. She has significant experience in the Airports and Seaports sectors, having been involved in a number of acquisitions as well as asset management activities in both sectors. Prior to joining IFM Investors, Marigold held roles with Wilson HTM as an equities research analyst and with the Corporate Finance division of PricewaterhouseCoopers, specialising in corporate valuations and strategy. Marigold is a CFA Charterholder, a Fellow of The Financial Services Institute of Australasia and holds a Bachelor of Accounting from Monash University. Marigold is also a Graduate of the Australian Institute of Company Directors. Mike joined Palisade in 2016, with a focus on asset origination, acquisition and management. Mike's previous experience includes three years as an Investment Director of CP2 Limited, where he managed a team of investment professionals and was responsible for sourcing and investing in infrastructure investment opportunities, and their ongoing asset management including representation on boards of directors for investee companies. Prior to this Michael was a Vice President of Deutsche Bank in the Investment Banking Division where he was the lead on execution of numerous M&A and capital market transactions principally in the utilities and infrastructure sector. Michael has also had roles at Barclays Capital and ABN AMRO in a similar capacity, in both Australia and the UK. Mike holds a Bachelor of Finance and Bachelor of Laws from the University of New South Wales. Kelvin joined Palisade in 2016, with a focus on asset acquisition and management. Immediately prior to joining Palisade, Kelvin was an Associate with Barclays PLC focused on originating and executing utilities and infrastructure transactions in both an advisory and a financing capacity. Kelvin was responsible for developing complex financial models and assisting clients with analysis, due diligence and investment committee processes. Before joining Barclays PLC, Kelvin was a Manager in the project finance team at ANZ Banking Group, responsible for executing and financing ports, toll roads, PPPs and other infrastructure assets. Kelvin holds a Bachelor of Commerce (Liberal Studies) majoring in Finance and Accounting from the University of New South Wales, a Graduate Certificate of Management from the University of Melbourne - Melbourne Business School. Kelvin is also a Graduate of the Australian Institute of Company Directors. Tom Ganley is Chief Financial Officer and Company Secretary of ADG, joining the company in June 1998. He has more than 25 years‘ experience in aviation finance, having previously held various senior finance and commercial management roles at Adelaide and Alice Springs Airports. A Justice of the Peace, he has a Bachelor of Accountancy and a Graduate Diploma in Applied Corporate Governance. Tom holds the International Airport Professional (IAP 2014 Valedictorian) post nominal designation and Tom holds Fellow memberships with CPA Australia, the Governance Institute of Australia, the Australian Institute of Management and the Australian Institute of Company Directors. To be the most successful airport business in Australasia. Our purpose is to provide safe, efficient and environmentally sound services that represent value for money for our customers, and optimise the financial returns to our shareholders. We recognise that stakeholders and the community judge us by the way we act. Our reputation is paramount and as a result, we will act with honesty and integrity at all times. Our workplace reflects our corporate values. Our customers are important and our focus on their needs will ensure our relevance and success. We are honest, ethical and professional in all that we do. We will deliver on our commitments and take ownership of our responsibilities. We encourage new thinking in our team. Our people are our most important resource and we appreciate their values, respect their rights, promote their talents and reward their commitment. We are an important part of the communities in which we operate and we will seek to engage with them at all levels. We take stewardship of our environment seriously. What information should I provide when lodging a complaint? When lodging your complaint, please provide as much information as possible. We’ll need to know the date and time of your visit to the airport, a description of the issue and any relevant details, as well as contact information so we can advise you on your complaint’s progression. Complaints about airline services such as baggage or flights will need to be directed to the airline; you can find contact details here. How will I know my feedback is being addressed? Upon receipt of your complaint, we will provide an acknowledgment, either verbally or by email that your feedback is being addressed. From there, the detail you have provided will be used to investigate the issue with the relevant managers and a response will be prepared. Depending on the complexity of the complaint, this response may take up to 20 working days. How do I escalate a complaint? If you are not satisfied with the response to your formal complaint, you may request a review by the CEO of DIA. A review is requested by communicating in writing. Unless the matter is a complex one, you can expect a response from the CEO dated no longer than 15 working days from receipt of your request for the CEO review. The response from the CEO will be the final communication with you on this complaint. Airservices Australia is responsible for managing and monitoring the impact of civilian aircraft noise. If you have an enquiry relating to flight paths or aircraft noise and would like to lodge a complaint, you can do so via their website. Since October 2012, Airservices has produced quarterly Noise Information Reports for major urban areas. These include information and analysis on aircraft movements, noise monitoring and complaint issues. Download the most recent report for Darwin. Airservices Australia provides many other resources regarding Australian aviation noise including Fact Sheets, access to relevant legislation, regulation and aviation policy and aircraft noise monitoring reports. Please visit the Airservices Australia website to access this information. Darwin International Airport is a Joint User Airport with RAAF Base Darwin meaning both civil and military operations occur at this airport. For all military aircraft noise complaints, please call the defence hotline and ask to speak with RAAF Base Darwin. Darwin International Airport is responsible for all civilian aircraft ground running noise. Please contact the Airport Management Centre to lodge a complaint.